After the exceptional success of Disney and BOOM! Studios’ Darkwing Duck comic book series, it was announced today that another old Disney Afternoon cartoon is returning in comic form: Chip ‘n’ Dale Rescue Rangers. The new ongoing series will debut December 2010 from Darkwing Duck writer Ian Brill and Marvel Superhero Squad artist Leonel Castellani as they take the diminutive detectives on all new original adventure. 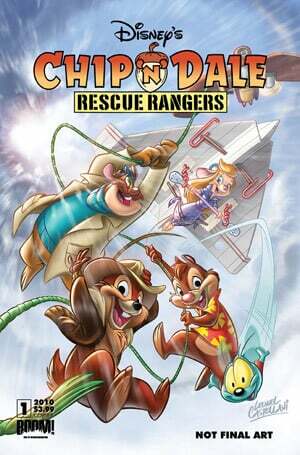 Chip ‘n’ Dale Rescue Rangers first debuted as a TV cartoon in 1989 as part of the Disney Afternoon animation block. It will return as a comic book with a debut issue that features two covers in a 50/50 split by Leonel Castellani and Magic Eye Studios respectively and a 1-in-10 incentive cover by Jake Myler. I’m SOOOOO hoping for a Tailspin book now!!! This is a good step forward for the series in hopes that Disney (if they ever get their crap straight and go back to making cartoon and no more live crappy actors) That they can finish the series. But, that’s just wishful thinking.